"Will potential customers please note that Ingram's are an independent family run removal company, with NO connections what-so-ever to any internet-based/online moving company or organisation." From humble beginnings Ingram's have now evolved into a company offering a wide range of services both to the public and commercial sector alike. Established for 60 years we are a family managed company that prides itself on delivering a consistent quality service tailored to individual customer requirements. Being a versatile company we cater for all types of requests for removals and storage. We employ professional staff and run a modern fleet of Mercedes Benz vehicles which allows us to respond to a very wide variety of requests from our customers, quite often at short notice. For up to date news, reviews and comments on our services visit Ingram's on Facebook. As members of the British Association of Removers we adhere to a strict code of conduct in all our dealings with customers, from their initial enquiry up to completion. Through our quality of work we have also gained British Standard EN 12522 accreditation for our professional domestic removals and storage service. Full details of our Document Storage and Archive Services can be found on our site www.ingrams-document-storage.com. Which? Trusted Traders have finalised their assessment process and endorsed Ingram's for inclusion on their directory - a sign of reputation and trust - Ingram's on Which? Trusted Traders. Most recently this resulted in Ingram's being awarded with a Certificate of Distinction for their continued efforts and investment in the industry. We are assessed on an annual basis by the auditors from British Quality Standards to make sure we are maintaining the highest level of service possible. Over the years we have built up a wealth of experience that few others can match. Without fear of contradiction Ingram's can boast to be the most experienced and professional independent removal company in the whole of County Durham - a Premier Removal and Storage company serving Durham and Darlington. Many would consider Ingram's as one of the finest removals companies in the North East due to our wide range of removals and storage services, backed by our extensive investment in equipment and training in conjuction with our professional accreditations. Our vehicles can often be seen in throughout the region carrying out local or long distance removals. The most recent additions to our Mercedes fleet of vehicles were introduced to assist in our fast growing market of academic moves and to negotiate narrow lanes and remote rural accesses. Many people claim Ingram's to be their favourite local removal firm. Popular areas we cover throughout the North East include:- Durham, Darlington, Bishop Auckland, Newton Aycliffe, Woodham, Newcastle, Shildon, Spennymoor, Ferryhill, Hurworth, Peterlee, Sedgefield, Middridge, Heighington, Barnard Castle, Middleton-In-Teesdale, Cotherstone, Romaldkirk, Richmond, Northallerton and Teesside. View our House Removals section for details of our extensive Housee Removals experience and how Ingram's can help you Move House in Durham or Darlington or nationally. 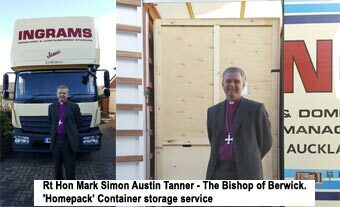 Pictured left is a recently completed job at Morpeth for the Rt Hon Mark Tanner - Bishop of Berwick. The Commercial and Office Removals section contains more details of our professional Office Removals, Office Relocations and Commercial Storage operations. 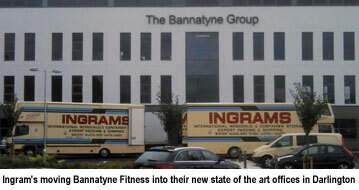 Pictured right are Ingram's wagons on site at Bannatyne Group's new headquarters located in Darlington town centre. Ingram's understand the importance to take the utmost care to avoid any disruption to business. We utilise the highest standards of staff, equipment and materials. Working with the customer we formulate a plan to implement the changes in a timely and effective manner. Over the years Ingram's have proven their reliability and versatility in carrying out complex operations. As well as our removals and storage services we also have a complete range of packaging materials for sale at competitive prices to both the public and commercial customers. We supply all sizes/shapes of cartons, boxes, carriers, covers as well as bubble-wrap, bubble-blanket and adhesive tape. View our Packaging section for more details of our packaging materials and Self-Pack sets. We look forward to helping you with your moving and storage needs - if you contact us by email but do not receive a response within 24 hours then please give us a call. Send mail to webmaster@ingramsremovals.com with questions or comments about this site. Page last updated on April 18, 2019 .